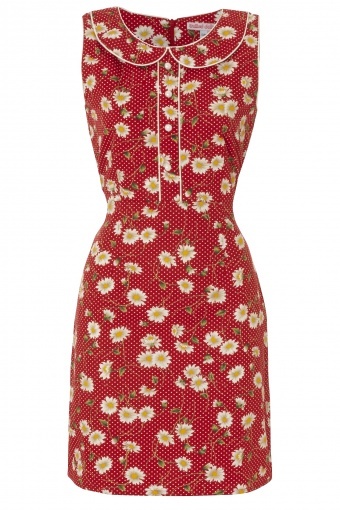 50s Cute Collar dress Pushing Daisies Red from Trollied Dolly. This super cute collared dress will take you through a multitude of occasions: demure enough for the boardroom, quirky enough to be eyecatching and with a 'nod' to all things fifties, this frock will have you steppin' back in to it, time and time again. Made of 100% coton in a cute daisies print. With a long rear zip for access this frock is slim-lined and well fitted, waist ties allow you to adjust the fit and perky piping and mother pearl buttons really pull the whole look togehter. We assure you this little number will send their hearts racing while you're kicking up baby powder on the dance floor.